Crater Lake Superintendent's Residence, Crater Lake NP, 1985. The Superintendent's Residence is an impressive structure of massive boulders and heavy-handed woodwork. The building's site is on a gentle hill overlooking the other period residences and administrative and maintenance facilities in the Munson Valley. The building is one-and-a-half stories in height. The foundation is stone and concrete. The first floor exterior walls are boulders with cement mortar that have poured-in-place concrete behind the boulders providing an even thicker wall. An unusual construction technique was used in building the structure. First, a heavy wooden formwork for the first floor was constructed, braced by the wood framing of the second floor and the roof structure. As the boulders walls were mortared into place the masons left a space of several inches between the boulders and the formwork where they poured concrete. While the masons worked on the first floor, carpenters continued work on the second floor and roof. When the stone and concrete wall reached the eaveline and had sufficient time to cure, the workers removed the wooden formwork and the load of the roof and second story automatically transferred to the masonry walls. For the most part larger boulders were used in lower sections of the wall but the builders could not help adding even more interest to the masonry by hoisting enormous stones up higher--such as the one on the front elevation to the left of the front door that was placed about three feet above the terrace floor and measures approximately five feet across. The stonework is battered and retains a strong visual tie with the steeply pitched gable roofs. The intersecting roofs, and the dormers and pent roofs that pierce the main roof are finished with wood shingles in a staggered pattern known as "hit-or-miss" that provides texture to the surfaces. The verticality of the roofs reflects that found in the surrounding evergreen forest. Gable ends are finished with vertical board-and-batten siding. The eave detailing on the gable ends adds a finely finished touch to the building. The barge boards at the gable ends are pierced by purlin ends shaped like nailheads that give the roof a tightly constructed feeling. A concrete beam finished with stucco spans the distance over the garage door where the heavy stonework would have been inappropriate. The building's front door is a handsome heavy wood door with wrought-iron hardware. Windows throughout the structure are original metal sash multi- light casements. Windows on the first floor have stone sills and heavy timber framing around the other three edges. Windows on the second story have simple wood frames. Double french doors, also of metal sash and wood framing, lead from the living room to the terrace at the front of the building. The path lending up to the terrace on the front elevation and the terrace flooring itself are flagstone. The low wall bordering the terrace is constructed of the same huge boulders as the rest of the building. The partial basement contains the garage space and the furnace. Rooms on the first floor of the building include the living and dining rooms, an entrance foyer, a kitchen, a pantry, and a large bedroom and bath. Upstairs are four bedrooms and two additional baths. Floors throughout the interior are oak with the exception of the basement floor which is concrete. Those in the kitchen and pantry are covered with linoleum. One wall of the living room contains a rubble masonry fireplace with a cut-stone mantle and hearth. The living room ceiling is finished with two-foot squares of scored wood tiles laid in a checkerboard pattern, that may not be original. The interior is filled with period furnishings including overstuffed couches and chairs in the living room, and a trestle table, corner cabinet, and matching chairs in the dining room. Wrought-iron light fixtures throughout the building are original. The building was used as the superintendent's residence, then as seasonal housing, and now is used for housing visiting scientists and other dignitaries during the summer months. Changes to the building have been relatively minimal. The kitchen has undergone some minor alterations. The double garage door that was originally wood has been replaced with a single overhead door and a small side door. Removable wooden shutters have been placed on all windows for use when the building is closed up in winter. The snow depth around the building consistently exceeds more than 15 feet. 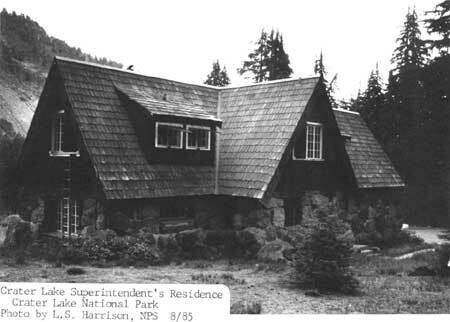 The Crater Lake Superintendent's Residence is of national significance in architecture because it depicts the best elements of the rustic style of architecture developed by the National Park Service during the late 'twenties and 'thirties. The building's high level of integrity is unusual in National Park structures that remain from that period. Also the method in which the building was constructed is an unusual solution to the thorny problem of building substantial structures in extremely short construction seasons. Successfully handled, [rustic] is a style which, through the use of native materials in proper scale, and through the avoidance of rigid, straight lines, and over-sophistication, gives the feeling of having been executed by pioneer craftsmen with limited hand tools. It thus achieves sympathy with natural surroundings, and with the past. 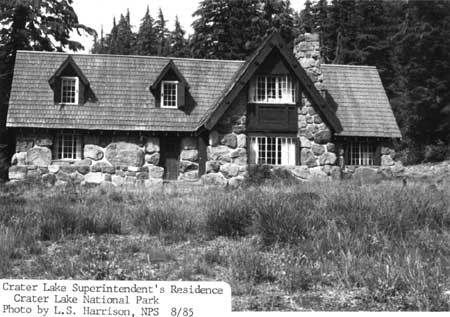 Sager's responsibility at Crater Lake included laying out the administrative, residential, and maintenance developments and establishing the basic design parameters to be followed. The administrative core included a ranger dormitory and an administration building forming two sides of an impressive plaza where visitors could park and have their first extended contact with Park Service personnel. The rustic image the buildings presented was continued through the hierarchy of small stone cottages that became progressively larger until it peaked in the Superintendent's residence at the top of the hill. In general, the residential area was hidden from view, as was the rustic maintenance area tucked away below the plaza. One exception to the lack of architects trained in rustic design was A. Paul Brown, the man who completed the working drawings for and probably designed the Superintendent's residence following the course laid by Sager. Brown was an Englishman who had worked for private-sector architect Gilbert Stanley Underwood before joining the Park Service. Underwood's monumental rustic buildings included the Ahwahnee Hotel in Yosemite, Grand Canyon Lodge on the North Rim, as well as Bryce and Zion Lodges. Underwood's work stressed various types of stone-and-concrete construction with plenty of log detailing. Brown could not have worked for an architect of Underwood's importance without being influenced by his design ideas. The building's unusual method of construction is noteworthy. The builders constructed a formwork to hold poured concrete, braced by the second-floor joists and the roof structure of the building. As the stone masonry was constructed in stages and the concrete poured in place into the formwork behind the boulders, work on the upper wood-frame portion progressed at the same time. As the masonry walls reached the height of the eaves and after the concrete was sufficiently cured, the formwork was removed and the wooden structure of the roof and upper story automatically transferred to the stone and concrete walls. The construction season at Crater Lake could be as short as twelve weeks during a particularly harsh year. By using this method the entire exterior of several buildings could be erected in one summer. This construction technique also allowed the use of huge large stones in the exterior walls while at the same time providing a flat wall on the interior. At one time the entire Munson Valley group was undoubtedly the handsomest group of rustic structures in the entire National Park System; however, the heavy winter snows forced changes to many of the Munson Valley structures to accommodate the harsh climate. Over time only the Superintendent's residence remained in nearly original condition. The cedar shake roofs on the other buildings became too costly to maintain, so that most were covered years ago with metal roofs that shed the heavy snows even more quickly. As new housing was constructed those with families preferred the flat-roofed apartments that had more square footage and lower utility costs than the tiny stone cottages of the 'thirties. Those who remained in the stone cottages needed additional storage space, so over time they enclosed the terraces with wood-frame sheds. Access into the rustic administration building was difficult during the winter because of the snow shedding off the steep gable roof, so the park staff had an A-frame constructed over the entrance to make winter access easier. Although the other structures of the Munson Valley group were determined eligible for the National Register, these changes-- most of which were completed during the 1960s--lessened their architectural integrity making them of less than national significance. Plans are underway to reverse many of these architectural changes or to make alterations more compatible with the original design. The Superintendent's residence remains an architectural gem--a remnant of an ambitious development project that gave a strong architectural identity to a large park. 1 William Tweed, Laura E. Soullière, and Henry G. Law, National Park Service Rustic Architecture: 1916-1942 (San Francisco: National Park Service, 1977), p. 93. 2 Interview with Merel Sager conducted by William Tweed, August 18, 1976. 3 Telephone interview with William G. Carnes conducted by William Tweed, August 31, 1976. Greene, Linda. Historic Resource Study: Crater Lake National Park, Oregon. Denver: National Park Service, Denver Service Center, 1984. National Park Service files including Pacific Northwest Regional Office Inventory, Crater Lake National Park. Telephone Interview with William Carnes, retired NPS landscape architect, conducted by William Tweed, August 31, 1976. Telephone Interview with Merel Sager, retired NPS landscape architect, conducted by William Tweed, August 18, 1976. Tweed, William, Laura E. Soullière, and Henry G. Law. National Park Service Rustic Architecture: 1916-1942. San Francisco: National Park Service, 1977. The landmark boundary line is a line 25 feet out from the building, parallel to all of the building's exterior walls.